Do I Have Acne Mechanica? 1 Do I Have Acne Mechanica? 1.1 Can Acne Mechanica Be Treated? Acne Mechanica (or Friction acne) is just that, simply acne caused by a combination of heat, pressure, and friction on the skin. 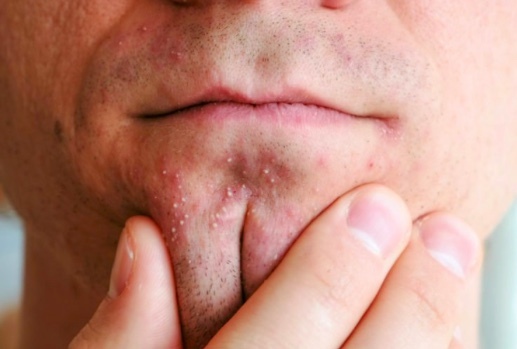 Unlike Acne vulgaris, this type of acne has nothing to do with hormones. straps from shoulder bags, tight, restrictive clothing, and underwear, regular wear of helmets and other headgear, a musical instrument in prolonged, close contact with the skin, belts etc. Where the skin is subjected to constant rubbing, the lack of air getting to the area can mean that the pores can get inflamed and blocked, causing acne. This can cause little pimples to occur under the skin which can, if left untreated, develop into redder, more unsightly lesions. This can occur some of the time, for example in the summer months or it can occur all year round. For example, those who are expected to wear a full uniform even in intense heat such as soldiers, commonly suffer from this kind of acne. Can Acne Mechanica Be Treated? Mouth and Chin – If you play a musical instrument with a chin strap, or play an instrument such as the violin this could result in acne occurring in the areas in close proximity to the instrument. Salicylic acid, sulfur, and resorcinol are some of the most commonly used treatments for acne mechanica. Generally, it is sold in liquid form, such as a lotion, a gel or in a body scrub, some formulations are for the face alone while others can be used on the whole body. It’s normally recommended to use them daily, at least twice a day. Most formulations can be bought over the counter and can be purchased from most major supermarkets and pharmacies which make them readily available. The problem is with these over the counter remedies is that they can be a bit of a double-edged sword; while they can work well, they can be caustic on the skin and quite often cause a lot of irritation, dryness, and redness. It can also increase your skin’s sensitivity to the sun which means you’re more at risk of burning unless you wear an SPF each time you are out in strong sunlight. Prescription strength variations of these medications are also available and may be more effective but it will require a visit to your doctor and may result in even more side effects due to its potency, which can often exacerbate acne and even damage the skin irreparably if used long term. The key is to find the balance between a treatment powerful enough to fight the cause and control symptoms while still gentle enough to use daily without irritation and damage to the skin. A great product to consider is Exposed Skincare, currently the worlds best selling acne treatment. It ticks all these boxes. It is truly unique and harnesses the power of both scientific and natural ingredients to make an explosive combination that combats the cause of spots and prevents new ones from forming. What’s more the manufacturers guarantee that your acne will be cleared within 30 days or you will get your money back!